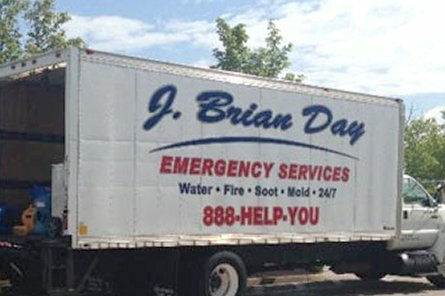 J. Brian Day recently helped a commercial client in Franklin, MA clean up and restore their business, which had suffered severe water damage. The client’s store had flooded after a series of severe thunderstorms hit the area. Cleanup and restoration was completed after hours as an added convenience for the client. As one can see from the photos below, the client was in dire need of a quick and efficient solution. Luckily, our crews were able to arrive at the store, diagnose the situation and implement a solution all within a short window of time. It is one of our core values to not only be available to clients 24/7, but to be able to work and think extremely quickly. As a business ourselves, we realize the financial hardship that can be created by downtime, and the stress involved with a disaster or crisis. We also realize how water, fire, soot and mold can damage your products, causing you the potential to lose even more money. Whether we are dealing with water, fire, mold or structural damage, our personnel is truly committed to providing only the highest level of restoration services. We conveniently work around your schedule, trying our absolute hardest to get your business back and up and running as soon as possible. If you are a local business and find yourself in the middle of a disaster, keep our phone number (888-HELP-YOU) nearby. We offer 24-hour emergency service, as well as direct insurance billing to simplify the payment process. For more information on our services or if we service your area, please contact us today!